Entering college for the first time or returning to continue your education is a big step. But you are not alone. 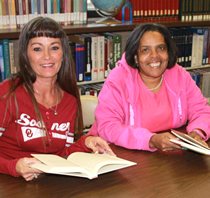 In fall 2006, almost one in three community college and undergraduate students in Oklahoma were 25 or older. The Oklahoma State Regents for Higher Education consider an adult student anyone who is 25 years or older, but we also recognize that students of any age may carry adult responsibilities such as parenthood or full-time employment. Work schedules, families and other obligations can make it difficult to go to college, but Oklahoma colleges and universities have expanded programs to fit your busy life and meet the job requirements of today's workplace. A college degree can truly change a person’s life. In fact, college graduates make about $1 million more than high school graduates during their lifetimes. A college degree will give you a competitive advantage in the marketplace and provide you the skills and knowledge valued by employers in business, government and organizations. The State Regents offer many programs and services to help you return to college or begin your college education. For more information, review the information provided on this site, email studentinfo@osrhe.edu or call 1.800.858.1840 (225-9239 in Oklahoma City). Photo courtesy of Murray State College.